For other people with a similar name, see Alexander Lebedev (disambiguation). Alexander Yevgenievich Lebedev (Russian: Алекса́ндр Евге́ньевич Ле́бедев, IPA: [ɐlʲɪˈksandr jɪvˈɡʲenʲjɪvʲɪtɕ ˈlʲebʲɪdʲɪf]; born 16 December 1959) is a Russian businessman, referred to as one of the Russian oligarchs. In early 2008, he was one of the golden 100 top Russian billionaires listed as the 39th richest Russian worth an estimated US$3.1 billion by Forbes magazine, but by October 2008 he was worth only $300 million. In March 2012, he was listed by Forbes magazine as one of the richest Russians with an estimated fortune of US$1.1 billion. His fortune has since declined, and he is no longer considered to be a billionaire. He is part owner of the Russian newspaper Novaya Gazeta and owner of two UK newspapers with son Evgeny Lebedev: the London Evening Standard and The Independent. Alexander Lebedev was born in Moscow. His parents were part of the Moscow intelligentsia. His father, Yevgeny Nikolaevich Lebedev, was an elite athlete–a member of the Soviet national water polo team, and later a professor at the Bauman Moscow State Technical University, Moscow's highest technical school. After graduating from Moscow Pedagogic Institute, Alexander's mother, Maria Sergeyevna, worked in a rural Sakhalin school and later taught English in a Moscow tertiary school. In 1977, Alexander Lebedev entered the Department of Economics at Moscow State Institute of International Relations. After he graduated in 1982, Lebedev started work at the Institute of Economics of the World Socialist System doing research for his Kandidat (between master's degree and doctorate) dissertation, The problems of debt and the challenges of globalization. He transferred to the First Chief Directorate (Foreign Intelligence) of KGB. According to The Sunday Times, as a KGB spy, he was based at the Russian embassy in London during the 1980s. He worked for the KGB's successor, the Foreign Intelligence Service, until 1992. Lebedev had the diplomatic cover of an economics attaché. According to his personal website, Lebedev's assignments included fighting capital flight from the Russian Federation. The bank is the core of the group of companies holding National Reserve Corporation, that according to Lebedev's personal site owns around US$2 billion of assets. In March 2006, Forbes estimates Lebedev's fortune as high as US$3.5 billion, but as of July 2013 he dropped out of the billionaires list and is no longer considered to be a billionaire. The National Reserve Corporation included the National Land Company (the biggest potato producer in Russia), National Housing Corporation (construction of affordable houses), National Mortgage Company (Национальная Ипотечная Компания), as well as interests in textiles, telecommunications, trams and trolleybuses, electrical power, chemical and tourist industries owning a large hotel network in Crimea and plan to create the National Reserve Park that will manage diverse tourist enterprises in Russia, Ukraine and France. Lebedev used to own the Moskovski Korrespondent, but according to Channel 4's Dispatches programme, Lebedev closed it down "for political reasons after it published a spurious article about Vladimir Putin having an affair with an Olympic gymnast half his age". On 21 January 2009, Lebedev and his company Evening Press Corporation (UK), part of Lebedev Holdings, bought approximately a 75.1% of share in the Evening Standard newspaper for £1. The previous owners, the Daily Mail and General Trust, continue to hold 24.9% in the company in the new firm, named Evening Standard Ltd. Lebedev promised to not interfere with the editorial running of the paper. Lebedev commented that during his time as a spy in London, he used the Evening Standard to find information. Paul Dacre, the editor-in-chief of the Evening Standard at the time of the sale said: "It's a very sad day for the paper, it's a very sad day for the Rothermeres. We are very sorry that it leaked out, we had no control over that. Everyone's been working very hard and there's a lot of hope for the future of the Evening Standard." In 2009 he entered into exclusive negotiations with Independent News & Media to buy the company's British national newspapers, The Independent and Independent on Sunday. Before the purchase was completed, his representatives offered the editorship of The Independent to Rod Liddle, former editor of BBC Radio 4's Today Programme. The offer was withdrawn after Liddle's putative appointment was opposed by the newspaper's staff and by a campaign online. On 25 March 2010, Lebedev bought The Independent and Independent on Sunday for £1. In 2012, National Reserve Bank (NRB) faced difficulties: corporate deposits decreased by 2.2bn rubles, retail deposits by 1.2bn rubles. 20% of the bank's liabilities had run off by the end of January 2012. In March 2012, two top managers left the bank. On 5 November 2012, Lebedev announced he would close all the regional offices of the National Reserve Bank and sell off the real estate as well as 75% of the bank's loan portfolio, worth 16.8bn rubles ($542m). Also in November 2012, Lebedev announced that he is selling off his assets in Russia. In September 2011 while appearing on a Russian television programme, he punched a fellow guest, billionaire property developer Sergei Polonsky (Сергей Юрьевич Полонский). Lebedev claimed afterwards that he had reacted to Polonsky's threat of violence towards him. Lebedev was later charged with hooliganism and sentenced to community service for that incident. Lebedev was formerly the Vice Chairman of Duma's committee on the Commonwealth of Independent States, the coordinator of Duma's group on interactions with Verkhovna Rada of Ukraine, and the coordinator of the State Duma group dealing with the city. After the assassination of a prominent Novaya Gazeta journalist Anna Politkovskaya, Lebedev praised in print the talents of Politkovskaya and suggested her assassins were actually trying to target the good names of her opponents. He pledged 25 million Russian rubles (around US$1 million) for the information leading to the arrest of the assassins. Lebedev is a founder and the President of the National Investment Council, a non-political and non-government organization working to improve the investment sentiments in Russia, protecting interests of the Russian business abroad, and fighting the negative sentiments towards Russian business. In March 2009, Lebedev announced that he would be running for mayor of Sochi, host of the 2014 Winter Olympics, but a court ruling declared his candidacy invalid on 13 April 2009. The court ruling was a result of a complaint by another candidate, Vladimir Turukhanovsky, that Lebedev's campaign received three donations from minors that is forbidden by Russian electoral law. According to the chief of Lebedev's electoral campaign, Artyom Artyomov, the three teenagers were led to Sberbank by a staff member of the Sochi council, given 500 rubles each (approximately $20), and told to donate the money to Lebedev's campaign. His campaigners sent the money back the same day it was received but still it was found sufficient to disqualify his candidacy. Lebedev said that he intended to appeal the court's decision. Monument Sorrow (Скорбящая) in London by sculptor Sergey Shcherbakov commemorating Soviet soldiers who died during World War II. In October 2008, Lebedev met with Tom Stoppard, John Malkovich, and Kevin Spacey to discuss a new Chekhov festival in Crimea, Ukraine. Lebedev was awarded the Saint Innokenty of Moscow Order by the Russian Orthodox Church and the Dialogue of Cultures medal by UNESCO. Lebedev's first wife was Natalia Vladimirovna Sokolova, daughter of the scientist Vladimir Sokolov, with whom he has one child, Evgeny Lebedev. They separated in 1998. Lebedev's second wife is Elena Perminova, a former model, with whom he has three children. ^ Harding, Luke (24 October 2018). "Twilight of the oligarchs: Communism's collapse made them multi-billionaires, but now Russian capitalism is in trouble. Can their colossal fortunes survive the downturn, or is this the end of an era?". The Guardian. Retrieved 12 May 2018. ^ a b "Alexander Lebedev". Forbes.com. 1 January 1970. Retrieved 17 March 2017. ^ a b c d e f g h "Archived item". Archived from the original on 6 October 2007. Retrieved 13 January 2007. ^ Harding, Luke (11 January 2009). "Alexander Lebedev: an oligarch we could learn to love". The Observer. London. Retrieved 16 March 2010. ^ a b c "Archived item". Archived from the original on 11 November 2012. Retrieved 22 November 2012. ^ "Alexander Lebedev". Forbes. p. 9. Retrieved 17 March 2017. ^ Brook, Stephen; Sweney, Mark (21 January 2009). "Alexander Lebedev's Evening Standard takeover: Dacre announces sale to staff". The Guardian. London. Retrieved 21 January 2009. ^ Sweney, Mark; Brook, Stephen (8 January 2010). "Rod Liddle lined up to edit Independent". The Guardian. London. Retrieved 12 June 2018. ^ Greenslade, Roy (11 January 2010). "Independent faces revolt from staff and readers if Liddle becomes editor". The Guardian. London. Retrieved 12 June 2018. ^ Brook, Stephen (19 February 2010). "Rod Liddle no longer in running for Independent editor". The Guardian. London. Retrieved 12 June 2018. ^ "The Independent bought by Lebedev for £1". BBC News. 25 March 2010. Retrieved 25 March 2010. ^ "НРБ продолжают покидать высокопоставленные сотрудники :: Экономика :: РБК". Top.rbc.ru. 22 December 2016. Retrieved 17 March 2017. ^ Siddique, Haroon (18 September 2011). "Alexander Lebedev in Russian TV punch-up". The Guardian. London. Retrieved 5 May 2015. ^ "#962 Sergei Polonsky". Forbes. 5 March 2008. ^ "Russian tycoon Alexander Lebedev charged over punch-up". BBC. Retrieved 31 January 2013. ^ Blomfield, Adrian (29 September 2008). "Mikhail Gorbachev returns to Russian politics". Telegraph. Retrieved 17 March 2017. ^ Тирмастэ, Мария-Луиза (14 April 2009). Александра Лебедева отослали переводом. Kommersant N66 (4121) (in Russian). Retrieved 14 April 2009. ^ "The Press Baron and His Son". Russianmind.eu. Retrieved 17 March 2017. ^ "Who's that girl? Elena Perminova". Fashion.telegraph.co.uk. Retrieved 17 March 2017. Wikimedia Commons has media related to Alexander Lebedev. 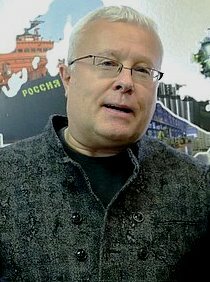 Alexander Lebedev (10 June 2005). "Beyond Khodorkovsky". Wall Street Journal. Retrieved 13 January 2007.